On February 23, 2014, two things in NASCAR happened. Dale Earnhardt Jr. won the Daytona 500, starting his season off just as he had left it in 2013... with momentum. Although if you are Social Media savvy, another tidbit happened. During a prerace interview, Dale Jr. was heard saying that IF he indeed won the 500, he would join the social media network “Twitter." Fans have been waiting for a long time to hear those words and to finally have the chance to hit that oh so familiar FOLLOW button. Did Jr. live up to his word as promised after his 500 win? Yes, oh yes he did, and has basically taken over NASCAR in his own little “Junebug" kind of way. However, is social media always a good venue for athletes? Let's take a look. As Jr. made the media run, hitting up Letterman and other talk shows, this was the tweet that was shown to the world. A Twitter star was born. Since his Daytona run, Jr. has been quite chatty when he wants to be . He answers fans tweets, takes pictures of his food and he campaigns. Last Sunday evening after the Auto Club 500 in Fontana a fan asked Dale Jr. if Robert Griffin III aka RGIII, young quarterback of Jr.'s favorite football team, The Washington Redskins, should be the Grand Marshall for the NASCAR Sprint car race in Richmond. Dale Jr. started a campaign and just like that, in less than 24 hours not only did Richmond respond favorably but so did RGIII. Jr. is also toying with the idea of trading “cars" with Indy driver/friend Graham Rahal, for ether a race or exhibition and you guessed it - BOOM, just like that, The National Guard is all in! It was Rahal that dared Jr. to drive his car, and NOT on an oval track. Jr.'s response was quite comical. “Have you seen me drive road courses?" Any Jr. fan knows what he meant by that. Suffice it to say, Dale Jr. knows marketing. He learned how to tweet quite well in just a short amount of time. Who can resist his tweets to his girlfriend, his pictures with his famous father and his urban type chatter with friends and fans? No one, and that is why this is a good thing for NASCAR. One can only wonder what might happen if he gets involved in what is called a “Twitter War." We have seen many drivers take to Twitter to air their aggressions after a race and it is rather comical. The fan bases easily get involved and carry the force of each driver's cause all the way to that precious goal on Twitter called "TRENDING.."
I almost hope he does, to see how he would handle a random moment like that. Remember, this is the driver who started a FaceBook for NASCAR fans, called “Infield Parking” years ago. 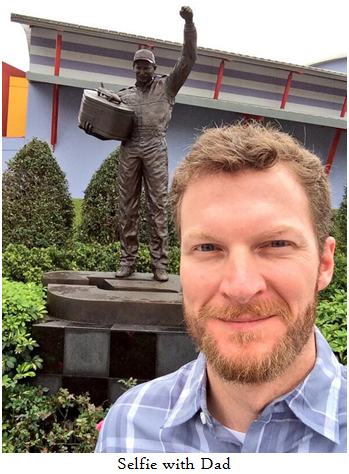 Would the real Dale Jr. stand up or the marketing genius stand up for such a challenge? We may find out. The season is young and he has already had no problem debating Tracks vs Tires vs Cars vs Crew Chiefs. If I can give Jr. one bit of advice it would be this...be yourself and don’t allow a marketing team to take over your account or your opinion. Fans love the truth and they can smell a marketing ploy all the way from Loudon to Fontana. It's OK to campaign for a QB or swap cars with an Indy driver... don’t be a sponsor driven driver that only dribbles out tweets because he/she HAS TO. Keep it up with the fans and Junior Nation will always be there. They have been for years already Dale Jr... waiting patiently for you. Thank you for joining us and feel free to hit that “Follow“ button below.